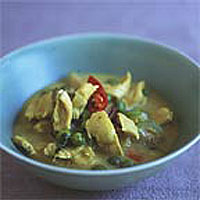 Bring 30ml of water to boil in a non-stick frying pan or wok and add the curry paste and milk. Stir until well combined. This will take a few minutes. Add the chicken and vegetable stock. Simmer for 5 minutes. Add the aubergine, soy sauce, sugar and fish sauce, if using, and simmer for about 3 minutes, until aubergine is done. Add the shredded lime leaves, chilli (if using) and torn basil leaves to taste. Mix well and cook for a further 1-2 minutes.